Rethink Urban promotes the awareness of placemaking by diverse groups around the world, partners with organizations to conduct urban exploration events, organizes educational and engagement activities, and provides at-cost consulting services. Placemaking is the process through which we work together to shape our public spaces. Rooted in community-based participation, Placemaking involves the planning, design, management and programming of shared use spaces. More than just designing spaces, Placemaking brings together diverse people (including professionals, elected officials, residents, and businesses) to improve a community’s cultural, economic, social and ecological situation. 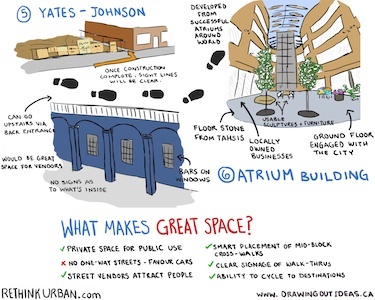 What makes great space? Placemaking is the process that creates great public spaces. It is a creative but intentional process. Placemaking builds on our growing environmental awareness by helping communities adapt and thrive within our constructed and our natural world. A leading proponent of placemaking is the Project for Public Spaces (www.pps.org). Lorne Daniel is the founder of the Greater Victoria Placemaking Network and a member of the Placemaking Leadership Council, an international advisory body formed by PPS. ‘tactical urbanism’ small scale community-led space transformations: Park(ing) Day; book boxes; chair bombing; street yoga; etc. In early 2013, we launched a very successful pilot called The Places Project to test community interest in urban placemaking walks. Participants talk about community spaces at the end of one of our Places Projects walks. What does the future hold? We are currently exploring community interest in a “Cascadia Placemaking” event – a gathering of placemaking proponents from across the Pacific north-west of the U.S., British Columbia’s lower mainland, and of course us here on Vancouver Island. Interested? Get in touch. 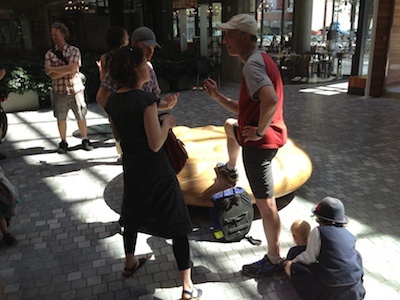 Here are some of the organizations and initiatives related to placemaking in Greater Victoria. Let us know who we have missed! The City Talks: a lecture series sponsored by the University of Victoria’s Committee for Urban Studies. The City Walks: a series of walking tours, thematically linked to City Talks, exploring urban form in Victoria. Hosted by Vincent Gornall. Vincent’s Victoria: blog of City Walks organizer Vincent Gornall. Resilient Neighbourhoods: collaborative project between Victoria’s Community Social Planning Council and Transitions Victoria to support neighbourhood resilience and placemaking in Vic West. Vibrant Victoria: online discussion forum that includes discussion of urban issues and Greater Victoria development plans. ‘Placemaking’ chapter, City of Victoria Official Community Plan: overview of principles related to public space, heritage buildings and related factors in City of Victoria urban planning. Todd Litman Planetizen blog: commentaries about urban issues by Victoria urbanist and transportation planner Todd Litman.